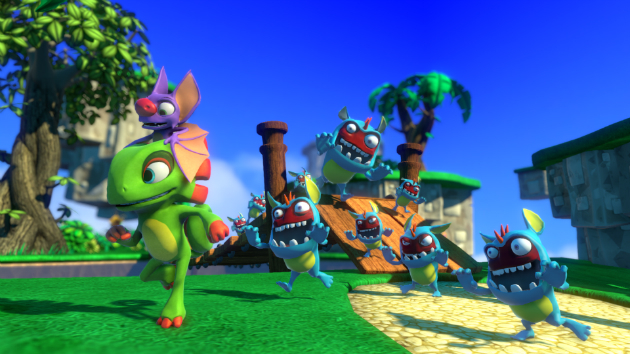 There’s been a lot in the news lately about the new video game Yooka-Laylee (get it?). It’s the flagship product of a new company called Playtonic Games, which features a lot of the creative staff from Rare. And this new game is considered to be a spiritual successor to the wildly-popular Banjo & Kazooie series. But that’s not what’s got people talking. This is: Playtonic put up a Kickstarter campaign to finance the game… and they reached their initial multi-thousand British pound goal in less than 40 minutes. That’s got to be some kinda record, we think. “Yooka-Laylee (yes, like the tiny guitar) is a 3D platformer starring Yooka, a bipedal lizard-like dude, and Laylee, a purple “wisecracking lady-bat.” They have unique abilities, such as Yooka’s tongue-grapple and Laylee’s tactical sonar blast, and together these best buds explore five worlds filled with weird characters and feisty bosses. Also, one of the abilities is a “giant fart bubble.” Playtonic knows the way to its players’ hearts.” And their pocketbooks, it would seem. Head on over to Engadget to find out more.